This page contains affiliate links; if you make a purchase through my links, I earn a small commission at no additional cost to you. 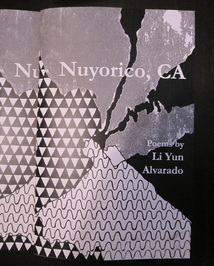 Li Yun Alvarado's Words or Water is an affective map of the Nuyorican archipelago, as oceanic as it is embodied. In vivid and uncompromising poems—about love and family, about the politics of tweezing and the intricacies of Puerto Rican rum, about the artist Keith Haring's lover Juanito Xtravaganza and the imperialism of Old Navy t-shirts—Alvarado traces the “Atlantic currents” of diaspora while honoring quotidian practices of survival and struggle: “my parents government-cheesed / our lives into normalcy.” Women emerge here as counter-genealogical figures (Don Quijote's Dulcinea, the poet Julia de Burgos, who provides an epigraph, mothers and sisters, biological and otherwise) and as guides to a revolutionary knowledge, an affirmation of our bodies even as they are policed and colonized. From the port cities of Nuyorico, Words or Water claims its own freedom by rerouting geographies:“homes anchored / to hearts and backs.” In that sense, the title is not so much binary as it is strategic and metaphorical; Alvarado's flow finds words for “estos latidos” (“these heartbeats”) while memorializing what words fail to convey: "I scavenge for lost / pockets of me." Li Yun Alvarado's poems carve a double-tongued space of longing and resistance, where we can pause to breathe. Read release and renewal in the soft, clear light of her words. 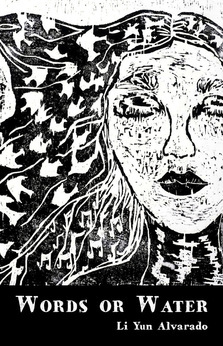 In Words or Water, Li Yun Alvarado chooses both. This book is simultaneously a meditation and a riptide. External violences from bullets to cancer disrupt our inner worlds. Unconditional love brings us back to center where life regenerates into its full prowess in the nuances of a first and final breath. We are reminded that life is good even when it isn’t. move from New York City to Long Beach, CA in 2012.